The logic model is a tool that helps managers evaluate the effectiveness of a program. The tool allows the user to list the input, output and outcomes of the process. connect table rows to illustrate the process flow. After that we drag and drop the NodeListView control from the Toolbox and set its IconSize property to Size(50,50). This property tells the control how big the items in the NodeListView should be rendered. Last but not least we set the Resize mode of the DiagramView to Fill, which means it will occupy all available space when the user changes the size of the application window. The RedimTable method changes the number of rows and columns of the TableNode to be the ones specified as arguments. Each of the tables in the logic model has two columns – one for a bullet and one for the label. The count of rows varies. Then we use the Tag property of the TableNode.Cell objects to store their row index. We will use it later when we handle events. The other tables are created in a similar way. The three rectangles where users drop tables are ContainerNode-s. 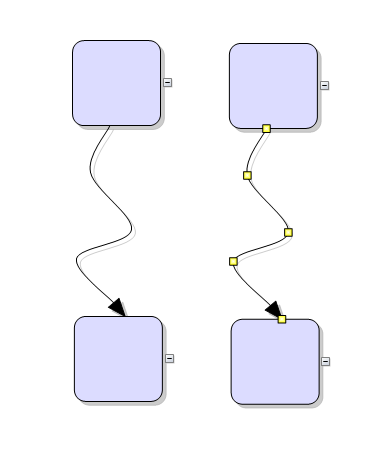 These are special kinds of DiagramNode -s that can hold other nodes. Once placed into them, the containing nodes move with the container. Containers can resize automatically to fit all items but in our case we will forbid this. We let the container accept new children and do not allow the user to fold, which means to collapse it. //raised when the size of the ClientRectangle has changed. The resizeNode and arrangeTags methods adjust the size of the TableNode and assign to each cell in the second column of the node its row index as a Tag. We won’t list the methods here, you can check them in the source code available for download. If it is within the container we add the node. In the first part of the method we handle the case when the user has chosen to add a new row. The new row is inserted at the end of the table with the AddRow method. We use the Tag property of the TableNode which points to the location of the bullet for this table and we render it to the first cell of the new row. //raised when the user draws a link between two tableNode-s.
About MindFusion.Diagramming for WinForms: A programming component that provides any WinForms application with a full set of features for creating and customizing all types of diagrams, flowcharts, schemes, hierarchies, trees, graphs etc. The control provides numerous ways to save and load a diagram, six auxiliary controls and more than 15 automatic graph layout algorithms. Diagram elements include scrollable tables, container nodes, multi-segment arrows, custom diagram item types and many more. Further details here. 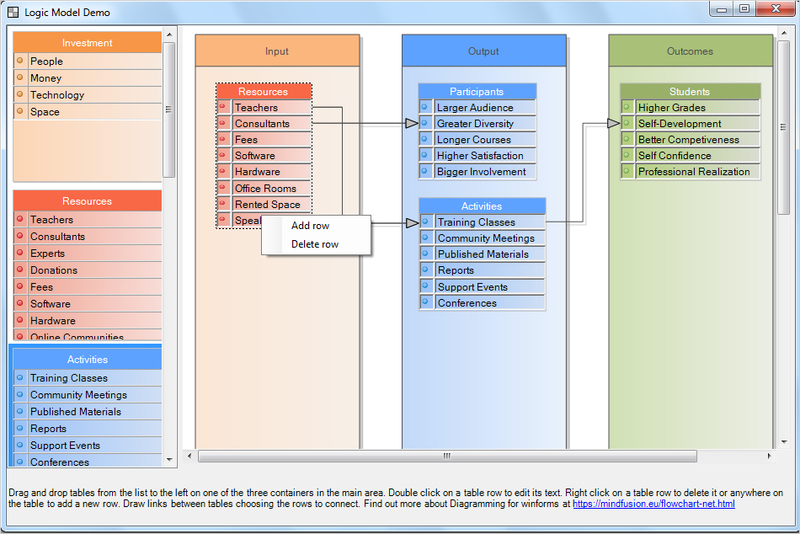 Diagramming for WinForms is a royalty-free component, clients get 12 month upgrade subscription when buying a license. The source code is also available for purchase. Visit the buy page for a list with the current license prices. The component no longer keeps a separate segmentCount field, removing a common source of errors. The SegmentCount property now calculates its value from ControlPoints elements. The UpdateFromPoints(updateGroups, updateSegments) overload has been removed too. SegmentCount setter no longer refuses changing number of segments if auto-routing is enabled or the link is a self-loop. The ModifierKeyAction.ExtendSelection mode selects items within the lasso without deselecting old ones. The Visio Stencils import API provides access to BeginArrow and EndArrow values. The Visio Stencils import API provides access to Connection elements defined for a shape. It is now enough to set EnableStyledText to enable styled-text mode without having to also enable PolygonalTextLayout. Fixed bug where ItemAdded event wasn’t raised for interactively drawn items. Miscellaneous UI control assemblies (NodeListView, LayerListView, Ruler, etc) have been merged into a single MindFusion.Diagramming.WinForms.Controls.dll. 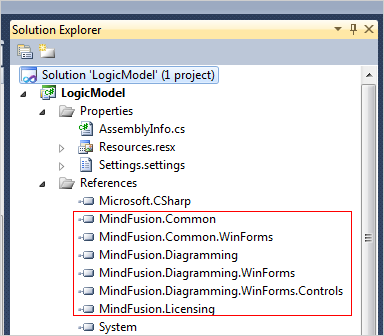 Updated assemblies are also available as MindFusion.Diagramming NuGet package. About MindFusion.Diagramming for WinForms: A programming component that provides any WinForms application with a full set of features for creating and customizing all types of diagrams, flowcharts, schemes, hierarchies, trees, graphs etc. The control provides numerous ways to save and load a diagram, six auxiliary controls and more than 12 automatic graph layout algorithms. Diagram elements include scrollable tables, container nodes, multi-segment arrows, custom diagram item types and many more. Further details here.